A new set of configuration files discovered in the latest beta of Apple's OS X El Capitan desktop operating system point to an unreleased Apple product— perhaps an iMac refresh waiting in the wings— with a new-to-Apple 4K resolution. The files, as noted by French website Consomac, point to a new built-in display sporting a standard 4K 4,096-pixel-by-2,304-pixel default resolution. Speculation over which unannounced product may get a 4K upgrade centers around Apple's smaller 21.5-inch iMac, which hasn't seen a significant change in two years. That position is reportedly backed up by icons found in related files that identify the device as an iMac, but their association is unclear and AppleInsider is unable to confirm it independently. Packing a 4K display into the 21.5-inch form factor would yield a desktop with around 218 pixels per inch, the same as Apple's 27-inch 5K version. 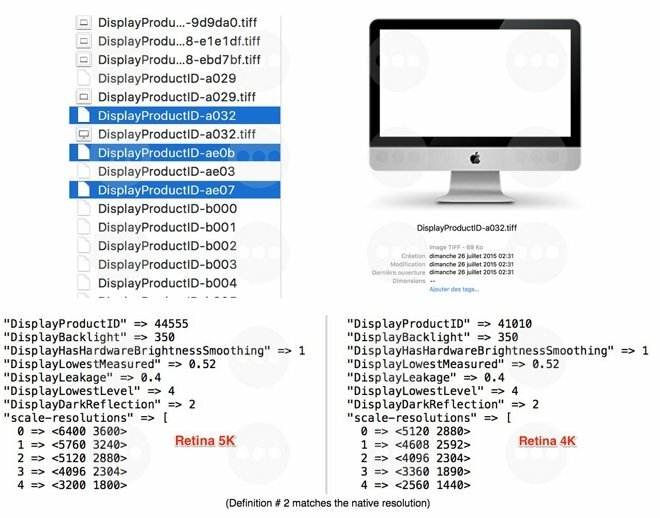 According to the files, users of the hypothetical new iMac would be able to choose scaled resolutions up to 5K. Samsung is thought to be one of the principle suppliers of the 4K display panels, an unsurprising choice given their history in Apple's desktop supply chain. This is the second time in the last three months that an El Capitan beta hinted at an upcoming 4K Apple desktop. Analyst Ming-Chi Kuo of KGI Securities said last week that he expects new iMacs will debut in the coming months. He did not, however, give any indication of a 4K-resolution 21.5-inch iMac.